Who said s’mores are just for kids?! 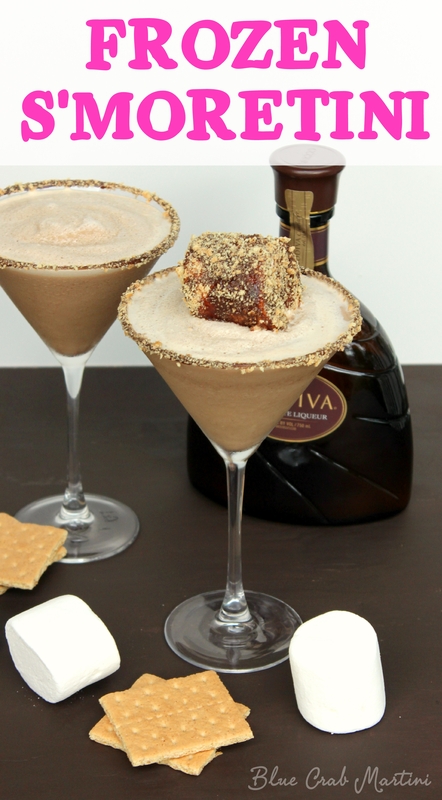 The classic childhood treat is all grown up in this tasty Frozen S’moretini. Rich chocolate, graham crackers, and marshmallow infused vodka all blended with ice- it’s the perfect summertime drink! Hi everyone, I’m Christin and today I’m excited to share one of my all-time favorite drinks with you here on Just Us Four. I’m the cupcake baker, cocktail shaker, and picture taker behind the blog Blue Crab Martini. I’d love it if you stopped by to visit me sometime! You can also follow my kitchen adventures on Instagram and Facebook. When it comes to s’mores, it’s all about the marshmallow, right? Perfectly toasted with a crispy outer layer and an ooey-gooey, drip down your chin, sweet center- yum! Getting it right is an artform, and a tasty one at that. 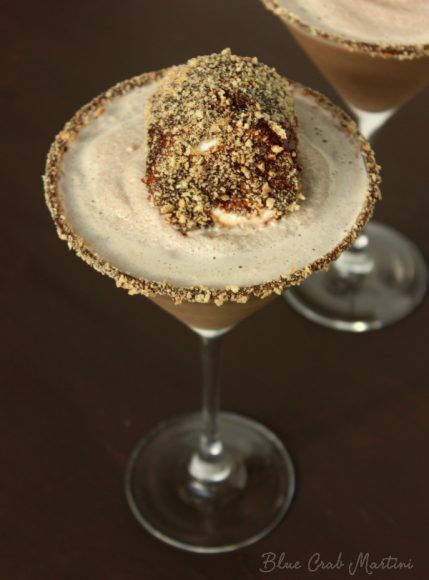 For this Frozen S’moretini, I had originally planned to use store bought marshmallow vodka. I’d been eyeing it up all winter long, just waiting for summer to arrive so I could make this very drink. Well guess what? It seems that they stopped making marshmallow vodka! At least that’s what I was told during my third unsuccessful liquor store stop. Whether or not this is true, or if the stores I visited just happened to be ransacked by a bunch of marshmallow maniacs, remains to be seen. Nonetheless, I decided marshmallow vodka sounded pretty easy to make at home (marshmallows + vodka = marshmallow vodka, right?!) Luckily, my intuitions proved correct and this made for one delicious, full of marshmallowy-goodness drink. 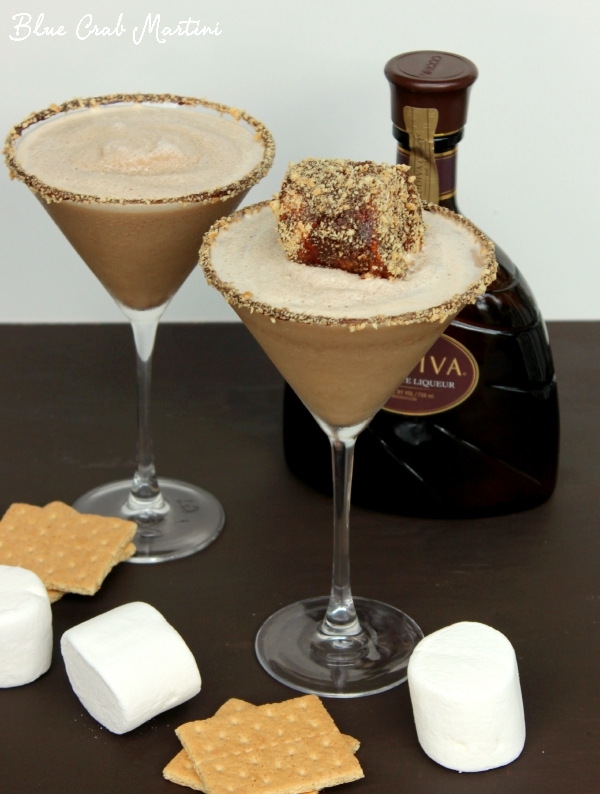 Each sip of this Frozen S’moretini is like taking a bite of homemade, campfire-worthy s’mores (with a splash of vodka of course!) Cool, refreshing, and totally delicious, it’s the perfect way to unwind after a busy fun-filled summer day. Cheers! 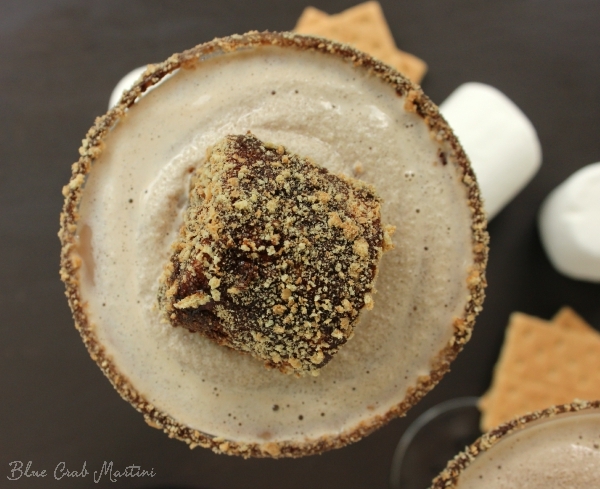 Marshmallow-infused vodka, rich chocolate, and sweet graham crackers- this Frozen S'moretini makes for the perfect summertime drink! *Note: toasted marshmallows would be extra delicious! Begin by making the marshmallow-infused vodka. Cut each marshmallow in half and place into a measuring cup. Pour the vodka over the marshmallows and muddle together. Let it sit for at least one hour in order to extract as much flavor as possible. Pour the blended drink mixture into two martini glasses rimmed with chocolate and crushed graham crackers. Top with a marshmallow coated in chocolate and graham crackers (optional).